Take out bubbles at the top to make bubbles below them drop on the floor. You can try this trick this easily in Bomb bird levels. Use walls to reach higher bubbles, but make sure you get the aim right. Keep an eye on such a set up and aim higher even if there are few same-colored bubbles. If your shooter bubble hits them, you may get a massive drop. Before popping bubbles, make sure you know what your objective is. Completing the main objective quickly will allow you to score more points and earn stars. Some of these goals dropping all pigs, popping any 6 top-row bubbles, clearing all bubbles before the timer runs out, dropping a single or multiple pigs by popping bubbles encircling them, popping bubbles with hatchlings inside them etc. You can easily find out what level you will be playing by looking at the level icons on the world map. If there is a pig drawn on a level, then you can safely assume that it’s about piggies and you will have to drop them on the floor. You will have to pop bubbles six times in a row to activate streak. 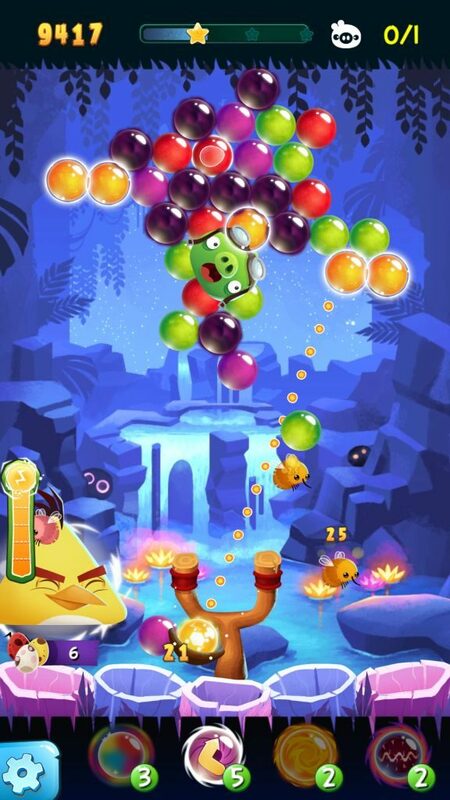 When activated, you will receive a special bubble, aka power-up that will help you clear several bubbles at once. The streak meter appears when you pop bubbles three times in a row. Make sure you pop more bubbles without fail to activate streak. In Red Bird levels, you can get the Red Rock Pop Special bubble when you activate streak. This power-up blasts through anything in its path, including obstacles like rocks, wood and glass. Use it when you can’t find a bubble match, even with the spare bubble, which can be swapped with the one on the slingshot. You can also use the Red Rock Pop to drop multiple pigs at once. Just aim it towards pigs that are in the same line and release to drop them. In speedy Chuck levels (yellow bird), fill the streak meter to activate Chuck’s Color Pop. It will remove any bubble that matches the color it hits. For example, if you launch this special bubble to hit a green bubble than all bubbles of that color will be removed from the game board. When you aim the color pop at a pack of bubbles, you will notice all same-colored bubbles are highlighted. If used at the right time, it can clear several bubbles once. Use it when you see lots of similar-colored bubbles scattered all around pigs to clear them at once. This special bubble takes the color of the next bubble and changes all bubbles of that color when it hits them. You can also use it to change the color of interconnected bubbles of two different colors into a single color. Splash Pop is available in Matilda levels. This power-up can pop everything nearby. Its blast radius is bigger so launching it at a group of bubbles will remove several at once. Obstacles such as wood can easily be destroyed with this power-up. You can activate Power Pop in Stella levels. When the streak meter is full, blast pop is activated. Launch it to clear a row of bubbles. The best use of blast pop is to clear the top-most row connected to several rows of bubbles underneath it to make lots of bubbles fall down. You can bank shots off the wall to clear upper rows. You can get this power-up in Terence levels or Pop-a-Pig levels. Launch the Smash Pop into a pack of bubbles and it explodes, destroying several bubbles at once. Use it when you are having difficulty to find a same-color match as it destroys bubbles of any color. You need successful bubble matches in a row to trigger a streak fill. Once the pop meter fills up, you receive a booster, i.e. a special bubble. So make sure you go for every match, even if there are two bubbles on the front row. Every match adds to the pop meter, but make sure that all matches are in a row. Reach accessible areas to quickly achieve 6 matches in a row. Rainbow Bubble: Use the rainbow bubble if you can’t find any matches. It will match with any color. For example, if there are lots of green and blue bubbles sticking together and you have two maroon bubbles, just pick the rainbow bubble to clear all green and blue bubbles. Mighty Eagle Eye: Can be very useful if you want to reach the nooks and corners of a bubble pack. It extends the aiming line and also displays where the shooter bubble is going to land. Crusher: You can use it to clear all bubbles of the same type. You just have to hit a bubble and all bubbles of that color will be cleared. Fireball: It can destroy anything that comes in its way, stone blocks, glass, wood, you name it. Use it on levels that have too many obstacles blocking your matches. You have two groups of similar-colored bubbles – blue and red. The red group has fewer bubbles and the blue group has more bubbles. The latter is just above the first group. If you have the red bubble mounted on the slingshot and a blue spare bubble, then switch to the blue one. You can then bank shots off the wall to clear blue bubbles, which will make all red bubbles fall down. If you have more bubbles, say orange bubbles in the first row and have two different bubbles, green mounted on the slingshot and orange, then switch to the orange bubble to take them out. If you can’t find any matches with the current bubble on the slingshot and if you find a few bubbles that match the spare bubble, the switch over to that bubble and remove them. Many levels will have objects like glass and wood that will make it difficult for you to reach certain areas. Glass is fragile and can be removed with one single shot, but breaking wood blocks will require more than two or three shots. Aim bubbles at wood blocks to smash them only when you can’t find any matches. Better to use them for something more productive than waste them. Pop-a-Pig is a fun game mode that lets you collect pigs to earn rewards every day. 1. Complete Pop-a-Pig daily tasks to get tickets as rewards. 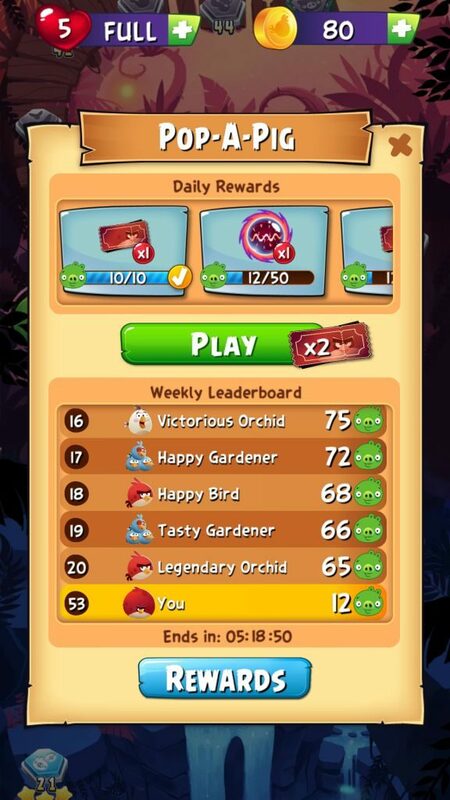 The “daily rewards” section can be seen above the “play” button. You will receive a single ticket if you collect 10 piggies and 2 tickets if you collect 100 piggies. 2. You will receive 1 free ticket daily. a. Complete trophies (achievements). You can find the trophy section on the left side of the screen. Tap it to get a list of tasks. Complete them. You will receive at least 5 coins per trophy. b. Keep an eye on new events. You might receive coins as milestone rewards on completing special events. These events are available for a limited time. c. You can also receive coins if you are placed in the top 20 on Pop-a-Pig leaderboard. Tap “Rewards” to have a look at several prizes. These are weekly rewards. d. You will get 10 free coins if you link your game to Facebook. This will also let you save progress. What do you do with the tickets? Tickets are used to play the Pop-a-Pig endless challenge mode, which unlocks at level 25. How are people amassing thousands of pigs in the first day of a weekly tournament? I’d like the answer to that question, too! The weekly tournament just started today and the number one player has over 5,000. How is this possible? That’s strange! Hope there’s no cheating involved. Yes how about more tickets for pop a pig so one might get more play time? P.S. Love this game more than any other I’ve ever played. You will receive a free ticket every day. You will also get tickets if you complete certain Pop a Pig “Daily Rewards” missions such as collecting 10 pigs (1 ticket) or collecting 100 pigs (2 tickets). You can also buy tickets using coins. 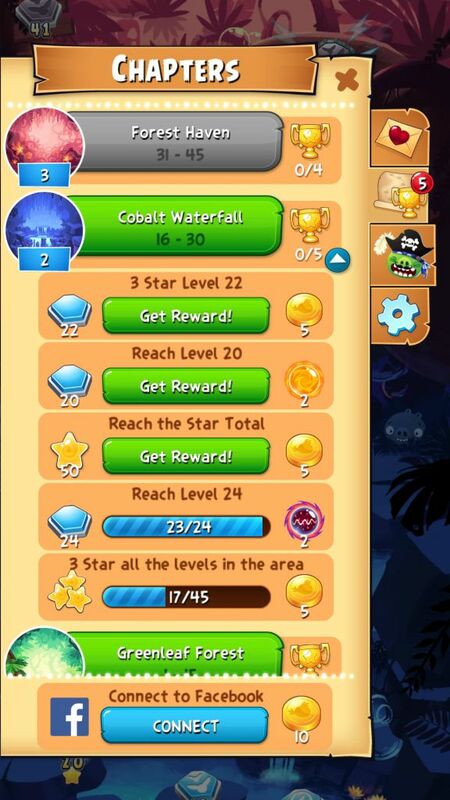 To earn coins, complete limited time events such as “Wanted Pigs” and trophies. The event and trophy icon can be seen above settings (gear icon) on the left side of your map screen. How About more lives for “pop a pig” and not having to wait 24 hours for the lives to renew?